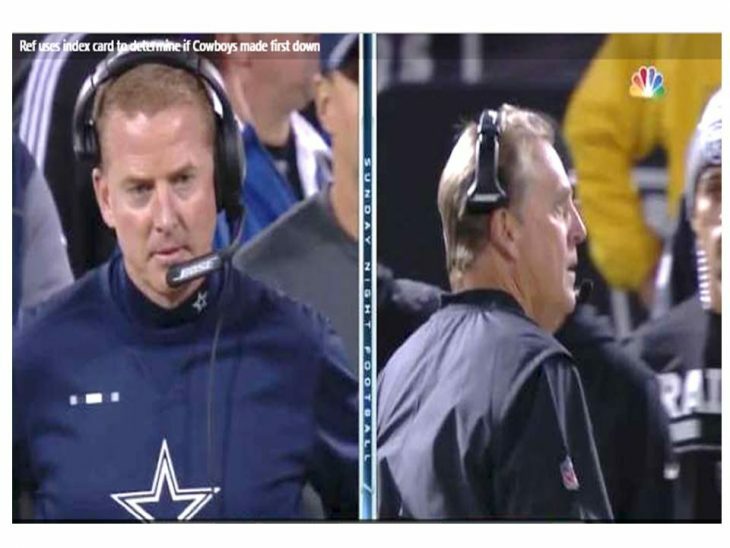 Oakland Raiders head coach Jack Del Rio and Dallas Cowboys head coach Jason Garrett were both confused by the use of an index card to determine a pivotal first down during Sunday Night Football. The Cowboys escaped with a 20-17 victory over the Raiders and were the beneficiary of one of the most confounding rulings in recent memory. Cowboys tight end Jason Witten caught a pass and it was originally determined he earned a first down before being overturned upon review. On the ensuing play, Dak Prescott powered through the defensive line but the referees struggled to determine whether he made it past the first-down marker. 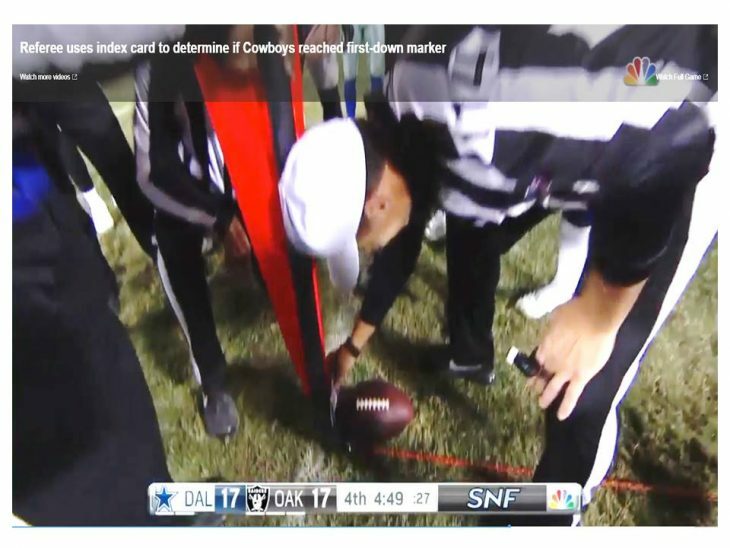 To the surprise of viewers everywhere, referee Gene Steratore unfurled an index card and placed it near the measuring device, before ruling Prescott had indeed earned a first down. Both coaches were caught off guard by the unusual sequence of events. “Never. Never seen air like that and it somehow got turned into a first down. The air between the ball and the stick. That’s sure short and it goes the other way. Period,” Del Rio said via Dan Hanzus of NFL.com. The Cowboys went on to secure the victory but Garrett too seemed surprised by the first-down ruling. “I don’t know that I’ve ever seen that one … We made it by the thickness of the card,” Garrett said via Lakisha Jackson on NFL.com. If the Cowboys sneak into the playoffs, they’ll know who to thank.